Number of championships: Barcelona won the La Liga (the Spanish national league) championships 24 times, most recently in the 2015-16 season. Number of Cup wins: Copa del Rey – a record 29 times; Copa de la Liga 24; Supercopa de España – a record 12 times; Copa Eva Duarte – 3 times; UEFA Cup – a record 5 times; UEFA Super Cup – 5 times: Latin Cup – 3 times. UEFA Champions League wins: 5 times. * Book Official FC Barcelona Tickets Now! * FC Barcelona Tickets Have High Demand, Don't Miss The Opportunity. * FC Barcelona Tickets Are 100% Guaranteed. FC Barcelona, also known as "Barça" for short, are one of the most well-known and successful football clubs in the world. Located in Barcelona, Catalonia, Spain, to this day, Barca remains a significant part of Catalan identity. The club was founded in 1899 in Barcelona, Catalonia, Spain, by a group of Catalan, English and Swiss footballers headed by Joan Gamper. Under the management of Gamper for 25 years, the team showed great success in its first years as it competed in a number of regional and national cup games. From 1910 to 1913, the team won the prestigious Pyrenees Cup four consecutive times, and in 1928, the team won the Spanish Cup. However, the club steadily declined due to Gamper's suicide, the assassination of club president Josep Sunyol, the Spanish Civil War and the occupation of Catalonia in the 1930s. This unfortunate series of events marked a difficult time for the team, which failed to succeed nationally and abroad during this time. Things started to pick up for the team in the 1940s and '50s, as it won the Copa del Generalissimo in 1943, the La Liga in 1945, and 5 different national trophies in 1952. However, the next two decades marked another period of decline. It wasn't until 1978, when Josep Lluís Núñez was elected as club president, that marked success for the club. Josep's goal was to turn Barcelona into a world-class club and bring home the silverware, which began to come true in 1979 when the team won its first ever Winners’ Cup, the La Liga and the Copa del Rey in the following years. The nineties marked another turning point for the team with new manager (and best manager to date) Johan Cruyff. The players he assembled together took Barcelona to new heights – with wins in the UEFA Cup, the European Super Cup, the European Cup, and the Super Copa de España throughout that decade. Unfortunately, the early 2000s marked yet another decline in the team's achievement, with a frequent changing of managers and general instability. But once again, the club bounced back in the 2004-05 season winning both La Liga and the Super Copa de España. The following years were marked by the entrance of star players such as Ronaldinho and Messi, and Pep Guardiola as manager, who led the team to a string of victories in the UEFA Cup, the UEFA Super Cup and the FIFA Club World Cup. The 2015-16 season was hugely successful for the team, as it won the FIFA Club World Cup for the 3rd time, La Liga for the 24th time, the Copa del Rey for the 28th time, the Super Copa de España for the 12th time, and the UEFA Super Cup for the 5th time. What is Barcelona's Most Successful Period? 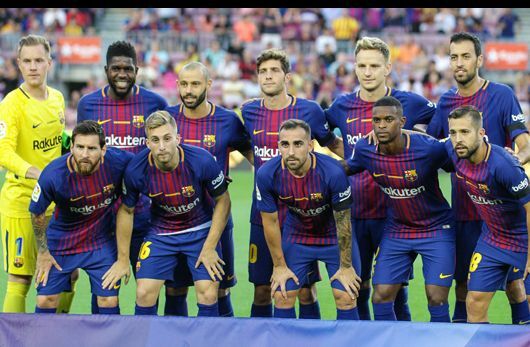 Despite their success over the years, Barcelona has experienced unprecedented success over the last decade, from the 2008-2009 season, to 2017-18, when they won a staggering 27 competitions. In particular, the 2015-16 season was one of the best football years for the team, where the team won a number of competitions. Their achievements include coming first in the La Liga, first in the Copa del Rey, and came champions in the EUFA Super Cup and the FIFA Club World Cup. In addition, they also qualified for the Champions League and reached the final of Super Copa de España. How to Buy Barcelona Tickets on Ticketgum? Choose a Barcelona game from the upcoming events shown in the menu above. Select your seating section, and how many tickets you would like. Click "Buy". Enter your delivery address (this can be a hotel if you are abroad). Write your email address and log in or create an account. Confirm your purchase and a confirmation email will be sent to your email address.